The community of Lexington Kentucky suffered a horrible loss this past Monday and the area’s brave men and women of law enforcement are struggling to find ways to cope with the pain. Every loss hurts, but some more so than others. On December 31st, for reasons that are still under investigation, an entire truckload of yummy Krispy Kreme Doughnuts suffered their final demise as they were burnt to a crisp. Fortunately the driver was able to escape the blaze and call 911, but sadly, none of the delicious carb and sugary filled treats were able to be rescued. The Lexington Police Department took to Twitter to humorously share their grief, sharing pictures of their officers sulking, heartbroken and grieving the loss. From across the nation, fellow brothers and sisters in blue were quick to offer their thoughts and prayers for those suffering in Lexington. A North Carolina police officer added his condolences. If you have any information regarding this catastrophe, please contact the Lexington Kentucky police department. 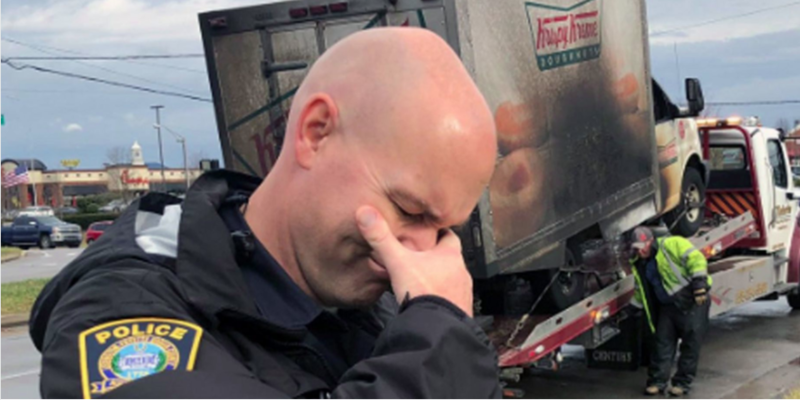 UPDATED January 5th: Kispy Kreme heard the painful wails and felt the tears of these fine officers and offered to console some of them with some free doughnuts! Krispy Kreme Flavored Jelly Beans Available on Amazon.com! Previous PlayTape Road Tape Is The Best Thing To Happen To My Toddler This Winter!